This article aims at investigating culture-driven development paths traced by social innovation practices in the city of Taranto, a one company town, grown around the steel company ILVA. By analysing some bottom-up urban regeneration experiences, the relevance of territorial investigations becomes clear. This study confirms the need to elaborate a different discourse on culture-led development to identify the conditions for enhancing the creative milieu and to acknowledge endogenous resources as pillars of an alternative development model. This approach is helpful both at a research level to question concepts such as ‘creative class’ and ‘creative city’ and at a policy level to support institutions and public administrations to incorporate the innovative potential of spontaneous practices in the city governance. Since many years European policies have acknowledged culture as a key factor for the development of cities and regions and as a pillar of innovation and social cohesion (ECIA 2014; EU 2013). Nonetheless, it is not yet clear how to measure the impacts of cultural initiatives, especially with respect to intangible aspects such as sense of belonging, social capital, empowerment, and quality of life in peripheral neighbourhoods and post-industrial cities. The evaluation of the impacts of cultural policies usually refers to economic indicators, such as the increase of employment and the wealth produced by the so called ‘Cultural and Creative Industries’ (CCI) (Symbola 2015; Ernst&Young 2014; KEA 2012), or the contribution  of big events, such as the European Capital of Culture (ECoC) to urban regeneration (Garcia e Cox 2013; Palmer et al. 2012, Garcia et al. 2010; Johnson 2009). There are several examples of industrial cities that experienced an economic renaissance and a redefinition of their identity and image thanks to specific cultural policies. Liverpool, Turin, Bilbao, Marseille, Genk are well known cities where culture played a strategic role becoming a real economic sector and a pillar of the new development model. If the results in terms of wealth, attractiveness and tourism are more evident and measurable, it is far more difficult to understand the role of culture as an agent of local development processes. This implies the observation of phenomena when they are still emerging and thus cannot be labelled within traditional classification frameworks or measured by means of statistics. Accordingly, the number of new cultural and creative enterprises or the increase of tourists are not useful indicators to measure the innovative potential and social impact of such initiatives. Instead, it is crucial to map the spontaneous clustering dynamics bringing local actors to aggregate, to develop projects and to cooperate with institutions and public administrations (Comunian 2011). This means to investigate what happens in the backstage to identify the preconditions enabling or impeding the emerging and strengthening of a creative milieu. Taranto is an ideal case study to investigate culture-led development paths, being a city that is facing a delicate transition from an industrial past as a one company town grown around ILVA steel plant and related industries. Taranto is not a best practice to look at in terms of lessons learned, it is instead a sort of laboratory as far as environmental, economic and social issues are concerned and where interwoven institutional and spontaneous initiatives are trying to reframe its identity as a starting point for an alternative development model. This study aims at contributing to the debate on urban regeneration and conversion processes of declining industrial areas by investigating the conditions fostering the emerging of new talents and forms of aggregation capable of carrying on durable initiatives. The attempt to recognize these dynamics and to identify the still latent potential of this city could enrich the comprehension of the social fabric in which public interventions will be implemented. Given the complexity and seriousness of the environmental, employment and social situation, in Taranto there is a multilevel attention involving several institutions and administrations from local to national scale. In particular, the central Government defined a unique coherent coordination of all the initiatives and related resources, in order to have a common juridical and financial framework for the regeneration and industrial conversion of Taranto. These interventions are coordinated by a dedicated task force directly lead by the Presidency of the Council of Ministers. The involvement of the Ministries of Culture, Environment and Economic Development confirms that the emergency affecting Taranto cannot be managed only through an industrial policy intervention. In fact, there are interwoven issues requiring a broader outlook beyond the single ministerial competences in order to grasp and connect the synergic aspects and face the major obstacles impeding the development of a new vision for Taranto. Undoubtedly, this is a valuable opportunity to try to consider culture as a key pillar of development strategies by acknowledging not only its economic impact, but also its contribution as far as innovation and social cohesion are concerned (Clementi, 2016). Besides, it is worth looking at the task force operating in Taranto to point out the replicability of an inter-ministerial direction promoting culture-driven strategies in close connection with the territories. The recent proposal by Federculture (Bocci 2016) of a coordination of public policies in the form of an inter-ministerial task force elaborating cultural policy guidelines to drive economic development goes in this direction, suggesting an approach to be implemented not only in critical areas, but at national level acknowledging culture as a competitive asset for a systemic development. This study on the creative and cultural potential embedded in Taranto highlights the need of situated analysis and more refined analytical tools to evaluate qualitative aspects concerning the spillovers and by-products of culture and creativity in terms of intangible assets, which are fundamental for an inclusive and sustainable development. The purpose of this article is to provide some policy lessons for public interventions more tuned with the territories. This means supporting an autonomous development of territories by enhancing their local resources and bottom up initiatives instead of launching programs detached from local needs and aspirations (Borgomeo 2013). The first part of this paper provides the coordinates of this research in terms of institutional framework and methodological approach. 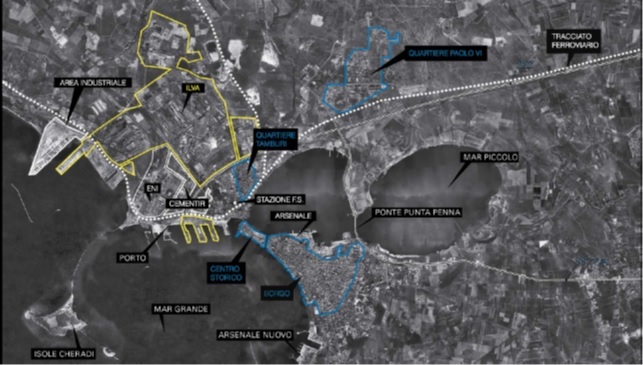 The second part introduces the case study of Taranto not only with respect to the industrial development, that has strongly affected the urban organization and the social fabric of this city, but also considering the institutional perspective hampering the elaboration of an alternative vision. Thirdly, some bottom-up urban regeneration practices are described in order to account for the presence of endogenous resources and latent potential. This introduces the analysis of the main obstacles to the strengthening of a creative milieu. The conclusions provide some methodological remarks to reframe both research and policy perspective on culture-led urban regeneration. This contribution underlines the need to map local resources (not only natural and cultural assets, but also competences, governance models, cooperation among public administrations and private initiatives) and support a process of innovation within the institutions themselves to be able to acknowledge the potential of spontaneous initiatives and embed it in their administrative practices. The action of MiBACT within the new PON Cultura e Sviluppo is adressed mainly to the southern regions (Campania, Apulia, Basilicata, Calabria and Sicily) to avoid the difficulties encountered in the previous programming period (POIn 2007-2013) that could lead to an automatic decommitment of the EU resources  (MiBACT 2014; Bocci, 2014). In light of that experience, the OECD-LEED Programme  has supported MiBACT with regional reviews to better understand the areas of cultural attraction identified by the Ministry for specific interventions. This joint action is meant to strengthen the institutional capacity of MiBACT at national and regional level and provides capacity building opportunities to local institutions and cultural practitioners. In compliance with the axes of the National Operational Program the territorial reviews explore three main themes: a) the management of cultural assets; b) culture driven innovation and growth of the local entrepreneurial system; c) urban and territorial organization for a better accessibility of the cultural attractors and the enhancement of the territory as a whole. This activity has developed during a phase of institutional transition. The reform  of MiBACT in 2014 integrates the responsibilities on Culture and Tourism and redefines the coordination between central and local administrations and the public-private partnership scheme. Moreover, differently from the POIn characterized by a governance highly distributed among regions, the new National Operational Program provides a centralized ministerial direction (MiBACT 2014: 5) and specific measures  supporting cultural and creative industries to develop entrepreneurial competences linked to the protection and enhancement of cultural heritage. In each region interested by the PON Cultura MiBACT selected some areas of cultural attraction as hot spots in which put particular effort to gain useful insights for better policies. These areas are characterized by long-standing problems and unexpressed potentialities. The choice of Taranto, as pilot for the Apulia Region, stems from the collaboration between MiBACT and the inter-ministerial Task force coordinating the initiatives for Taranto as foreseen by the Special Law establishing the Contratto Istituzionale di Sviluppo (CIS). Given the severe situation and the interwoven issues affecting Taranto, the research design followed a grounded theory approach (Glaser e Strauss 1967) meaning that the key issues orienting the investigation emerged discussing with local actors trough interviews and focus groups during the field visits that took place between March and May 2016. The interaction with local and regional stakeholders allowed us to adjust the research in order to grasp and deepen the issues raised by stakeholders and to expand the pool of interlocutors thus achieving a situated gaze towards the processes occurring in Taranto. A background analysis about the socio-economic situation, the cultural policies and related measures interesting the whole region and Taranto particularly preceded and informed the first steps of the fieldwork. A double level of attention – local and regional – was maintained also in the choice of interlocutors to involve, especially with respect to institutional representatives . In fact, many cultural initiatives and measures supporting youth entrepreneurship realized in Taranto should be considered as part of the regional strategy and the cultural creative scenario characterizing Apulia (Distretto Puglia Creativa 2015). An example of the close link between regional policies and urban initiatives is Bollenti Spiriti, a training experience that took place in the old town center of Taranto. The purpose of Apulia Region – Assessorato alle Politiche Giovanili e Cittadinanza Sociale – together with the Regional Agency for Technology and Innovation (A.R.T.I.) was to increase the effectiveness and impact of public policies addressed to youngsters by promoting the development of competences and new professional profiles. The idea behind this measure was to support an autonomous development of territories by training young practitioners with a community-led approach that would act as agents of change able of carrying on local development projects. Different from institutional actors, the investigation on associations and voluntary sectors focused at the urban level given that a priority for the relaunch of Taranto as a cultural and tourist destination regards the enhancement of the old town center affected by years of decay, both material and social. Gathering visions, critical points of views and proposals of the associations working for an alternative future for the city of Taranto was important to assess the presence of endogenous resources to support and enhance a process of urban regeneration. Cities are dynamic organizations whose identities are shaped and redefined in the interplay of infrastructures, social practices and sense of belonging (Sonda et al. 2010). Accordingly, during the field visits attention was paid to identify the links connecting places with the narratives connoting them and the people living there. This gaze on the interwoven issues concerning Taranto was useful to bring out the multifaceted identity of Taranto as the result of action nets (Czarniawska 2004), sense-making processes and rhetoric through which projects and visions are explained and justified (Corvellec 2001). Such a methodological perspective has proved to be fruitful to investigate a complex urban area as it is the case of Taranto where manifold visions and narratives characterize its past and are tracing possible scenarios. Taranto has a rich cultural and historical heritage including, among others, the Archaeological National Museum of Taranto (MArTA), Castello Aragonese, the medieval monastery S. Maria della Giustizia close to ENI and ILVA plants, the former Convent of St. Anthony, the Roman Villa inside Peripato Gardens, the archaeological underground sites in the old town centre dating back to Magna Grecia. It also presents important signs of a more recent history that becomes evident along the alleys in the old town centre, almost abandoned and decaying, in the polluted waters of the mar Piccolo where the military arsenal and shipyards are located and in the industrial areas of the biggest steel manufacturing plant in Europe, now in crisis. The actual city of Taranto is the result of a development strategy based on an industrial monoculture mainly related to the steel business. That economic model has affected the whole territory so deeply that any conversion process would be highly complex and challenging, not only under a perspective of economic growth, but also as far as environment, culture and vision are concerned. The overwhelming presence of the steel plant in fact has prevent the elaboration of alternative ways of living, producing and enhancing the local resources. The industrial development and the enlargement of the urban settlement begins in the Nineteenth century with the construction of the Arsenal and continues in the post-war period with the mechanical engineering sector and the steel industry followed by other production facilities with high environmental impact as the ENI refinery and Cementir. In the Seventies the Italsider steel plant was enlarged towards the sea in order to ease the docking of ships with serious consequences for the coastal ecosystem of the Great Sea. In 1991 the Ministry of Environment declares Taranto and the neighboring municipalities as “high environmental risk area”. This damage affects more than a hundred km2 of land and sea areas recognized as Sites of National Interest for decontamination (SIN). The industrial sites and new housing developments such as the neighbourhoods Tamburi and Paolo VI progressively emptied the urban centre of Taranto with inhabitants and activities moving in the new residential areas closer to the workplace (Santa Cruz Grau 2011). The current situation is an old town with historical buildings in a state of neglect despite various programs and urban renewal initiatives, including URBAN II Programme (2000-2006). Only a small part of the urban historical heritage has been restored and opened. Moreover, for most of the buildings already rescued there is not an urban strategy establishing new uses coherent with a city enhancement vision. This produces a paradoxical situation: despite having a considerable endowment of public real estate and restored cultural sites, many local associations supported by regional funds, are experiencing strong difficulties in finding a venue where to set their office and host their activities. As a consequence, the process of regeneration of the city of Taranto, especially the abandoned old town centre, has been slowed down, thus increasing inhabitants’ sense of impotence towards the possibility of building a different future. This situation poses an urgent question on multilevel governance and urban policies, on the one hand, and on the relationship between built environment and social practices on the other. Particularly in a city such as Taranto, the urban sustainability, meaning the support of institutions for the persistence of communities (García et al. 2015) requires dedicated measures to ensure the availability of open public spaces for collective uses thus enhancing an active presence of the urban population. The paradox Taranto is experiencing shows that the effectiveness of public interventions requires an integration of policies and the coordination of the various administrative levels, from the Region to the municipality, which implies consistent choices throughout the public administration chain of action. In fact, as we have just seen, seemingly independent policies, such as promoting entrepreneurship among youngsters, and defining the uses of public properties, if not designed and realized with a certain degree of synergy hardly contribute to activate urban regeneration processes and culture-based development. The museum heritage of the city is also an untapped potential: differences in ownership and management policies of the four museums  hampered the creation of an urban museum circuit that could increase the enhancement of the entire cultural heritage and the attractiveness of the city center. In this framework, Taranto cannot exploit the competitive advantage of being part of a region that has heavily invested on culture and creativity, youth and innovation policies over the past decade. A further proof that a regional strategy is unlikely to be effective, if not accompanied by a series of consistent measures at the local level, is the uneven development of the CCI sector showing different performances at the provincial level. Although Apulia overall is still one of the most dynamic  areas among the southern Italian regions (Symbola 2016: 83), the distribution of CCI by province varies significantly with a strong concentration in Bari (36.6 %), followed by Lecce (23.1%) and Foggia (12.8 %) (Symbola and DPPC, 2015). The province of Taranto is the last one (11.1%) as confirmed by the number of associates to the Production District Puglia Creativa (DPPC 2015). These figures need to be carefully read in order to understand what is happening in Taranto and to recognize signs of change that are still too weak or invisible to be detected with traditional statistical parameters. It is worth remembering that Taranto has abdicated to be a cultural and tourist destination by entrusting the steel plant the leading role of the urban economy. Having been a one-company town is not a condition that can be overcome quickly, despite a regional strategy promoting a development model based on the enhancement of territorial resources. The economic and employment weight of the steel plant inhibited the growth of local skills to build a diversified local economy and the development of an entrepreneurial system focused on tourism, cultural heritage, agrifood and handicraft. Moreover the identification of the city with the ILVA company produced even more insidious consequences affecting the sense of belonging and the level of confidence of the local population. In the narratives of local stakeholders this issue is tackled according to mechanisms of identification and differentiation (Czarniawska, 2008a).This confrontation has hindered the development of a collective vision and the start of autonomous development processes capable of bringing new perspectives to this city. There is a serious and widespread incapability of the city to identify with something diverse from the steel plant. The prominent role of industry in Taranto explains its backwardness in developing a creative cultural sector. Yet the interaction with local stakeholders has revealed an active community and the presence of numerous cultural initiatives that can initiate participatory and inclusive development paths around the recovery of the city and the sea. There are significant evidences of the attempt of local organizations to trace new avenues to re-appropriate the future, which have also a specific symbolic value. In fact, despite an urban setting not characterized by a cultural and tourist vocation, it is possible to appreciate an emerging role of local associations and micro enterprises that are exploiting local resources, above all the sea, acknowledged as constituent elements of Taranto. These are important clues towards a development strategy alternative to ILVA. Looking exclusively at the economic impact, the weight of the CCI and the overall cultural system (associations and institutions) is still poor. Differently, considering social mobilization, awareness raising and empowerment, Taranto is a telling example of how some areas of southern Italy are experimenting initiatives that build a sense of belonging without relying on the abused rhetoric of disadvantage and marginality as endemic characteristics of the south of Italy (Riitano 2014). These experiences of bottom-up social innovation (Garcia et al. 2015; Pradel et al. 2013) seek to give answers and alternatives to material and social degradation connecting and enhancing cultural environmental and relational resources. Some associations put at the center of their interventions the regeneration of the city centre and the recovery and the participatory management of urban spaces, meant as a common good, and through social integration initiatives. The association Labuat (Urban Architecture Laboratory Taranto) funded by Apulia Region through the initiative “Principi attivi – Young Ideas for a better Puglia”, promotes the participatory management of the urban cultural heritage in order to prevent their loss or alienation and tests new models for an integrated enhancement strategy. Through the re-appropriation of action spaces (literarily and in the metaphorical sense of ‘opportunity’) this initiative also acts as incubator of ideas and projects for contemporary arts and a responsible tourism. To name but one, a result of the partnerships developed by Labuat led to the creation of Tarantovecchia.org, a multilingual app to guide tourists discovering the cultural heritage in the city of Taranto. Some members of Labuat are also successful tenderer of technical and administrative assistance for the Municipality of Taranto in the launch of a Social Housing Program in the old town center. Another interesting case concerning the recovery of urban property for cultural purposes is the project KETOS winner of the 2015 edition of the call “Il bene torna comune” launched by Fondazione con il Sud. The proposal presented by Jonian Dolphin Conservation in partnership with five more associations, aims at restoring Palazzo Amati to create an Euro-Mediterranean Centre of the sea and cetaceans to realize the tourist potential of Taranto old town. It provides a space dedicated to start-ups and social entrepreneurship, a virtual library on the sea and a space for technological innovation especially addressed to youngsters. Other associations are more focused on the cultural production, like the non-profit organization Marcellino de Baggis and the theatre festival ‘stARTup’. The first has designed and implemented the International Festival of Documentary (Marcellino de Baggis Prize), now entering its third edition. This small-scale initiative has already shown a significant ability to attract talents and a good number of visitors (110 films submitted, 23 films selected for the competition and 15 directors present at the event attended by some 2,000 visitors). The Festival is an opportunity to talk about Taranto, enliven the city and develop job opportunities by hosting the winning film project. From this successful initiative come the idea of a permanent cinematography laboratory in order to combine training, creative, production and communication activities in a stable manner through the recovery of spaces in the Old City and the involvement of the inhabitants and the many local cultural operators. stARTup is a consolidated theatre experience dating back in 2009 which is based at the taTà Theatre, sole cultural garrison in the suburban neighborhood Tamburi. It has been acknowledged in the national scene for being a network project created within the larger system of theatre residences promoted by the Apulia Region. stARTup is an award-winning good practice in the theater sector whose artistic and social value has been widely recognized. It has been recently awarded the Paolo Ambrosino 2016 prize and it plays an important social animation role in one of the most degraded and polluted district, close to the steel plant, a place representing the unresolved contradiction between health and work. To account for the heterogeneous initiatives aiming at enhancing the natural and cultural resources of Taranto while also attempting to develop new business and social opportunities, it is worth mentioning the activity of the association called Jonian Dolphin Conservation (JDC). This is another significant experience of social innovation that contributes to developing an alternative development model focusing of the sea, one of the most relevant natural resources of Taranto, whose nickname is precisely ‘the city of the two seas’. JDC is the leader of the project KETOS, above described, that gives the sea a central role in promoting the attractiveness and liveliness of the entire city. The goal of JDC is to combine scientific research on the cetaceans in the Gulf of Taranto with dissemination activities contributing to environmental awareness raising among residents and tourists. At this end, JDC has made documentaries and set up spaces for exhibitions and events on marine environment related topics. More recently, JDC has equipped with two catamarans with a specific technology for detecting dolphins in order to promote dolphins watching both as a tourist attraction and as a study activity bringing tourists and locals onboard. The cases here presented offer the overview of a city different from how it is usually depicted: a city that is experimenting alternatives to the mono-industrial production by creating an urban fabric made of skills and resources (spaces, relationships). Although associations work in different fields of activity, they have developed formal and informal collaborations. One of these networks, the Committee for the Manifesto to the Old City, produced a document that provide an in-depth analysis and a proposal to support the urban strategy of the local government. From the eight thematic groups gathering the many urban associations of Taranto, the Committee representatives identified a set of priority actions. The document tackles the governance of the historical heritage considered a “strategic public resource” (Manifesto to the Old City 2015: 99). This document clarifies the rationale behind the effort of most associations working in Taranto. Beyond their specific focuses, the goal of these projects is the urban regeneration as a prerequisite for developing and attracting talents, new competences and new activities. The initiatives and the collective actors presented briefly in this paper are expression of the commitment of citizens concerned about their territory. They are trying to free up the latent potential of Taranto through bottom-up social innovation processes and to suggest new forms of governance of public spaces. Some of these initiatives already have the basic conditions to develop interdisciplinary synergies and intersectoral collaborations. The success of several projects in the calls of Fondazione con il Sud corroborates the design capacity of Taranto associations that are able to create valuable partnerships and to elaborate solid proposals that convincingly interpret the themes of the tenders. The other distinguishing feature of the Taranto association system is a pronounced tendency to develop self-feeding generative processes: most associations are born as evolution and consolidation of a good practice and in turn create new projects and associative formats. Such dynamism, if on the one hand boosts cultural and social effervescence, on the other hand is likely to prevent the achievement of a more structured and stable level that is necessary to produce a significant change. Figures about the number of CCI in Taranto confirms the weakness of its creative milieu compared to the rest of Apulia. Accordingly, this data should be interpreted not as absence of cultural and creative actors, but as a difficulty in consolidating a certain organizational model that is an obstacle to become relevant actors also in terms of economic, productive and employment impacts. The reasons for this difficulty should be investigated carefully to identify the obstacles preventing the sustainability and the achievement of a critical mass. The glimpse on the associations of Taranto shows high-level proposals and initiatives, also of national importance. This suggests that is not the lack of cultural, artistic and organizational competences of local actors, which nonetheless need robust processes of empowerment, that makes the cultural proposal still disaggregated and unsustainable, but rather the condition of isolation and the lack of strong partnerships with local authorities. Recent studies about social innovation practices show that the sustainability of bottom-up urban regeneration processes assume a constructive dialogue with institutions that should be able to support these initiatives by creating appropriate conditions (Garcia et al. 2015; Cristofori 2014; Pradel et al. 2013). Ensuring the continuity of cultural and social activities is crucial to safeguard a pool of competences and to give an encouraging signal to young artists and cultural entrepreneurs on the one hand and to realize a culture-driven agenda for the development of Taranto on the other. This is even more important when considering that many of these initiatives cannot be reduced to the sole cultural production, but acts also as a community work, sometimes even as a substitute for public action. Among the preconditions to promote a differentiation in the factors of development, it becomes, therefore, decisive, to realign policy actions and public support with the cultural and social ecosystem. This implies, firstly, a dialogue both between institutions and private entities and among different administrative levels in order not to stop what has already been initiated through policy measures and public resources and to avoid paradoxical situations such as the case of the regional youth policies stalled at the municipal level for lack of available venues. When a multi-level governance is involved, as in Taranto where urban decision making is intertwined with the regional and even national level, the sustainability of locally developed projects require a higher institutional support, also known as up-scaling (Garcia et al. 2015; Young Foundation, 2010). Secondly, the institutionalization of bottom-up social innovation practices presupposes a certain degree of innovation also in the decision making from the very definition of problems and stakeholders to the management of processes. This kind of change can starts recognizing that creativity and knowledge are embedded in society, in local communities and therefore are not a prerogative only of the so-called creative class. Enlarging the notion of creativity should also lead to overcome the idea that creative cities can be described in universal terms as a combination of factors replicable in different urban contexts (Pratt 2011). Examples drawn from Taranto suggest that the creative class is made not only of practitioners, but also of citizens reclaiming action spaces with initiatives improving the degree of social cohesion and the quality of life in neighborhoods and encouraging the development of skills and employment opportunities. The recognition that urban regeneration needs social innovation projects rather than top-down projects is a decisive step in promoting the enhancement of a multifaceted creative milieu. The associations of Taranto are expression of a strong social innovation potential and could affect policies by introducing changes in the definition of problems and in their management (Healey 2004). The real challenge then is how institutions respond to these innovative experiences and integrate them in their urban strategies (Cristofori 2014:135). Thirdly, the institutional support consists in creating the conditions enabling the activation of endogenous resources to respond also to stimuli and external opportunities . The priorities identified by the associations of Taranto include counseling and support services to acquire or strengthen the skills needed to access calls for projects/tenders and to manage complex projects. These needs are consistent with the findings stemming from the recent survey conducted by the Productive District Puglia Creativa through a work of territorial animation carried out in 2015 aiming at introducing associations, practitioners and small enterprises to the funding opportunities within the EU 2014-2020 programming period and encouraging their participation (DPPC 2015: 44-45). The kind of requests and suggestions raised by local actors are not limited only to business support services, but are also focused towards the international dimension, showing interest in benchmark analysis, international exchange opportunities and support to internationalization. A complex picture of the urban context turns out by investigating the urban regeneration and social innovation processes taking place in Taranto and it is not coincident with the media image of a declining industrial city. To account for this tangled situation the perspective of micro and qualitative analysis (Dobson 2015; Sacco et al. 2014; Comunian, 2011; Czarniawska, 2008b) and a situated approach (Pratt 2011) are needed. This analytical attitude must not lead to a trade-off between local and global or to a mono-causal viewpoint (Sacco et al. 2014). Instead it suggests an articulated territorial perspective to investigate context-dependent conditions for culture-based development. This implies moving beyond static snapshots to explore organizing processes and action nets among institutional and non-institutional actors. Taranto offers a valuable methodological lesson both in terms of research and in terms of governance. Relying on the concept of creative city to elaborate a new development model is highly risky (Miles e Paddison, 2005) if not aware that creativity does not develop through a predefined combination of factors. It rather defines in relative terms by investigating local resources and specific conditions enabling the emerging and consolidation of certain phenomena (Pratt 2011). Accordingly analysis at urban level can better investigate not only how cultural investments and policies works, but to whom and to what extent (Evans 2005). The fact that the creative entrepreneurship phenomenon is multifaceted and it is still little known finds confirmation in the apparent contradiction between the figures concerning the number of enterprises, turnover and employment in the cultural and creative sector of Taranto and the presence of exhibitors hosted in the concept store Spazio Murat  in Bari. This space, promoting regional expressions of contemporary art, gathers the excellence of Apulia handicraft production and the 20% comes from the province of Taranto, thus suggesting an emerging creative scene not enough known and enhanced and a possible trend to monitor and support. Unfortunately, the way the domain of CCI is defined fails to grasp emerging phenomena such as those above described. It is well known that, despite an important harmonization effort through international comparison, the classification criteria (Symbola  2016, Valentino 2013, Deroin 2011) are applied in different ways at national and regional level and are still not able to represent the composite world of practitioners and activities referable to this broad and multifaceted sector. The lack of more sophisticated tools for assessing the innovative potential and the contribution of cultural and creative projects makes it difficult for institutions to appreciate the value of voluntary urban regeneration initiatives and to embed their innovative potential. The risk of implementing initiatives and imposing models that are not coherent with the territorial needs and vocation also reflects the invisibility of certain phenomena that slips by statistics. For this reason, we need a different approach to culture-driven urban phenomena, also supporting innovation processes within institutions themselves. A second important methodological issue, both in terms of analysis and policy, concerns the redistribution mechanisms of culture-driven economies. For a long time creativity and culture have been described as the new engine of economic development, and the main resource for redevelopment and repositioning of the territories (Chapain 2010). Based on this assumption European policies have funded a number of initiatives supporting CCI, cultural routes, and capitals of Culture, among others, further fueling the belief that cities enhancing culture and creativity have more growth opportunities (Miles and Paddison 2005). Such generalization is dangerous because it underestimates the fact that among the so-called CCI, most are micro-businesses that are struggling to stay on the market and that count a mortality rate higher than the average of other sectors. Moreover, if we examine the characteristics of these creative professions (WIPO 2013, Pratt, 2011, Hesmondhalgh e Baker 2010, Menger, 2006, Towse, 2004, Throsby, 2001), the picture is rather bleak. Unstable occupations, multi-jobholding (combination of multiple occupations), freelancer temporary contracts that often do not include social security and suitable guarantees, seriously question the monolithic vision of the so-called creative class as an agent of change and sustainable development (Jayne 2004). In this respect Taranto offers the opportunity to reflect on the need for ‘more nuanced investigations’ – to say it with Pratt – which take into account also redistributive strategies and not only growth opportunities. The experiences above described indicate that in Taranto associations play an important role, both as community welfare and as an economic development factor by recognizing and exploiting endogenous resources (the sea, the historic center, theater and film productions, environmental research etc.) to open up new development avenues. Mapping local resources and untapped potential is thus crucial to enact multi-level governance and the upscaling of social innovation practices thus promoting a new development model that roots in local expertise and talents and cultivates them. Differently, the detachment of policies and institutional initiatives will further increase citizens’ distrust and boost wait-and see attitudes and dependence on public money. Moreover, without a vision, Taranto is likely to delegate the definition and implementation of economic conversion and urban regeneration paths. At the same time, the weakness of local institutions to engage local actors in co-designing an urban agenda move expectations towards other government levels, such as the inter-ministerial task force . Indeed, as we have seen in the case of the regional measures bogged down by the discrepancy of local interventions, the effectiveness of policies does not depend exclusively on the single institutions, whether central or local. The tendency to conceive culture as a sector certainly does not help to overcome the fragmentation of interventions and to bring institutions to conceive culture as a transversal agent of innovation and development (Clementi 2016). Therefore, the conditions and the manners in which culture can permeate institutions, business and civil society must be deepen considering not only economic indicators, but also the redistributive policies and social impacts affecting a territory (Leon 2016). The corollary of these remarks brings back the urgency of a territorial approach both in cultural policies and in the analysis of culture-driven urban regeneration processes that are by definition territorial since their potential, raison d’être and future root in the peculiarities of the territory in which they grow (Cristofori 2014: 18). The cultural effervescence and local resources found in Taranto shifts the old question on the impact of culture and CCI, so far linked to wealth and employment indicators, towards the elaboration of a different and more articulated discourse. The author wish to thank the group of experts involved in the project and particularly Andrea Billi for coordinating the research activity and for useful comments on this contribution; Franco Milella for fruitful discussions on the Apulia creative system and Antonella Carella for valuable insights on the urban and social fabric of Taranto and its major changes. Analyses on ECoC initiatives lead to divergent evaluations with light and shadow on their impacts and capability to stimulate an equal and durable development (Can-Seng Ooi et al. 2014, Steiner et al. 2013; Evans 2005, Jones e Wilks-Heeg 2004). In 2011 in agreement with the European Commission the Cohesion Action Plan (PAC) was approved in order to avoid the loss of European Structural funds due to incapability of elaborating sound proposals and managing funded projects. The OECD Leed (Local Economic and Employment Development) Programme includes among its policy fields the theme of local development. Some of the action foreseen in the reorganization of the Ministry had a wide media coverage: among others, the rules on tax benefits (the so called ArtBonus) and the enhancement of Italian museums by addressing the problem of their autonomy and the establishment of an “Italian museum system”. PON Cultura e Sviluppo Axis II: Activation of culture-driven development territorial potential. Region, regional Agencies, MiBACT, Superintendence, Municipality of Taranto, Cultural institutions (MArTA, Castello Aragonese, CREST), Universities, the Chamber of Commerce of Taranto. MArTA (State museum), Castello aragonese (managed by the Navy), Museo diocesano (Church) and Museo Etnografico (Municipality). Apulia is recognized as a region that has created an important ecosystem made up of technical bodies, instrumental agencies and public companies, capable of creating interesting opportunities for economic development and territorial enhancement resulting attractive both in terms of tourism and towards investors and creative talents. The Creative Europe program, the European Structural Funds and the Initiatives of Fondazione Con il Sud are relevant funding opportunities to support culture and tourism related projects. Spazio Murat, part of the network of contemporary arts (Polo del Contemporaneo di Bari), is not only a window on the regional creative productions but it also works as talent-scout helping to bring at light a phenomenon still little visible and poorly detected by sector analysis and consequently neglected also by policy makers. Symbola recalls the common traits shared by the main European classifications. The translation of cultural sectors in NACE codes has produced four categories of activities: a) creative industries including a range of creative-driven activities, meaning that they belong to the cultural sphere although related to other productive segments (e.g. food, fashion); b) cultural industries: artistic activities linked to the production of reproducible goods; c) historical and artistic heritage: activities closely related to the management of cultural heritage; d) performing arts and visual arts. Bocci C. (2016) “Cultura, Turismo, Industrie Creative: una politica Industriale per lo sviluppo dei territori”. Il Giornale delle Fondazioni. Bocci C. (2014). “Dall’Europa risorse e opportunità per tornare a produrre cultura”, X Rapporto Annuale Federculture. Borgomeo C. (2013). L’equivoco del Sud. Sviluppo e coesione sociale, Laterza, Bari. Chapain C., et al. (2010). Creative Clusters and Innovation. Putting Creativity on the Map, NESTA, London. Clementi A. (2016). “Proposte per una politica della cultura”, Il giornale delle Fondazioni. Corvellec, H. (2001). “Talks on track – debating urban infrastructure projects”. Culture and Organizations 7: 25-53. Comunian R. (2011). “Rethinking the creative city. The role of complexity, networks and interactions in the urban creative economy”. Urban Studies 48: 1157–1179. Comitato per il Manifesto per la Città Vecchia (2015). Manifesto per la Città Vecchia, Print Me Editore, Taranto. Cristofori C. (ed.) (2014). Terni e Bilbao. Città europee dell’acciaio, Franco Angeli. Czarniawska, B. (2008a). “Alterity/identity interplay in image construction”, in Barry, D. & Hansen, H. (eds.) The SAGE handbook of new approaches in management and organization, pp. 49-62. Czarniawska B. (2008b). “Organizing: How to study it and how to write about it”. Qualitative Research in Organizations and Management, 3(1). Czarniawska B. (2004). “On time, space and action nets”, Organization, 11 (6): 773-791. DCMS (2001). The Creative Industries Mapping Document, London. Deroin V. (2011). “European Statistical works on Culture”, Culture etudes. ECIA (2014). Create, Innovate, Grow. A new policy agenda to maximise the innovative contributions of Europe’s creative industries. Recommendations from the Policy Learning Platform of the European Creative Industries Alliance. European Parliament, Committee on Regional Development (2015). Report on the urban dimension of EU policies (2014/2213(INI)). Bruxelles. Ernst &Young (2014). Creating Growth – Measuring Cultural and Creative Markets in the EU. ESSNet -European Statistical System Network on Culture (2012), Final Report. Evans G. (2005). “Measure for Measure: Evaluating the evidence of culture’s contribution to regeneration”. Urban Studies, 42 (5/6): 959–983. Fondazione Symbola (2016). Io sono cultura- L’Italia della qualità e della bellezza sfida la crisi. Garcia B. e Cox T. (2013). European Capitals of Culture: Success Strategies and Long-Term Effect. DG for Internal Policies. Garcia B. Melville R., Cox T. (2010). Creating an impact. Liverpool’s experience as capital of culture. Impacts 08.European Capital of Culture Research Program. Glaser B. G., Strauss A. L. (1967). The discovery of grounded theory: Strategies for qualitative research. Aldine de Gruyter, New York. Healey P. (2004). “Creativity and Urban Governance”, Policy Studies, 25(2): 87-102. Hesmondhalgh D., Baker S. (2010). “A very complicated version of freedom: Conditions and experiences of creative labour in three cultural industries”. Poetics, 38 (1). 4 – 20. Jayne M. (2004). “Culture that works? Creative industries development in a working-class city”, Capital & Class, 84: 199–210. Johnson L.C. (2009). Cultural capitals: Revaluing the arts, remaking urban spaces. Ashgate. Jones P., Wilks-Heeg S. (2004). “Capitalising culture: Liverpool 2008”. Local Economy: 19, 341–360. KEA (2012). Measuring economic impact of CCIs policies. Bruxelles. KEA (2006).The Economy of Culture in Europe. Bruxelles. Leon A. (2016). “La Cultura tra riforma e crisi economica: un approccio territoriale”, Il Giornale delle Fondazioni. Menger P.M. (2006). “Artistic labour markets: Contingent work, excess supply and occupational risk management” in Ginsburgh V.A., Throsby, D. (eds.) Handbook of the Economics of Art and Culture. Elsevier: 765-811. MiBACT (2014). PON Cultura e Sviluppo FESR 2014-2020. Miles S., Paddison R. (2004). “The Rise and Rise of Culture-led Urban Regeneration”, Urban Studies, 42 (5/6): 833–839. NESTA (2015) The Geography of the UK’s Creative Industries and High-Tech Economies. Palmer R. Richards G., Dodd D. (2012). European Cultural Capital Report 4. ATLAS, Arnhem. Pignatelli F. (2013) Il progetto dello scarto. Taranto Shrinking City. BRAUBiennale del Restauro Architettonico e Urbano. Pradel M., Garcia M., Eizaguirre S. (2013). “Theorizing multi-lvel governance in Social Innovation dynamics”. In Moularet et al. (eds. ), The International handbook of Social innovation: 155-168, Edgar Elgar, Cheltenham. Pratt A. C. (2011). “The cultural contradictions of the creative city”, City, Culture and Society: 2 (3):123-130. Riitano A. (2014). Sud Innovation – Patrimonio Culturale, Innovazione Sociale e Nuova Cittadinanza, Franco Angeli: Milano. Sacco P., Ferilli G., Tavano Blessi G. (2014) “Understanding culture-led local development: A critique of alternative theoretical explanations”. Urban Studies. 51(139. 2806-2821. Santa Cruz Grau J. C. (2011). Dall’intrasformabilità al cambiamento intenzionale. Il caso di Taranto. Tesi di Dottorato, Università degli Studi Roma Tre. Sonda G., Coletta C., Gabbi F. (eds.) (2010). Urban Plots, Organizing Cities, Ashgate. Steiner L., Frey B. S., Hotz, S. (2013). European Capitals of Culture and Life Satisfaction, Working Paper 117, University of Zurich, Department of Economics. Symbola e DPPC (2015) Creative in Puglia. Throsby D. (2001). Economics and Culture. Cambridge University Press. Towse R. (2004). Copyright and Artists’ Labour Markets. Erasmus University Rotterdam. Valentino P. (2013). “L’Impresa Culturale e Creativa: Verso una Definizione Condivisa”, Economia della Cultura, 23 (3): 273-288. Young Foundation (2010). The open book of social innovation. NESTA. WIPO (2013). Draft guidelines on assessing the economic, social and cultural impact of copyright on the creative economy.